I have to admit I find the library’s transformation to be better than the after shots of Isobel’s room. (Go ahead and click here to see the before shots. We’ll wait.) I have a lot of things I’d like to change in this room, as well, but it lacks the transitional clutter of the nursery had has somewhat less chairs! Oh wait. What the hell am I thinking? This room has more chairs. When I went through and photographed my house for the Thrifted Home Tour I noticed all the random Scandinavian things and thought I had a mild Viking theme going on, but do you know what? If I had to sum up my decorating style I guess I’d say Chairs, chairs, chairs!!! 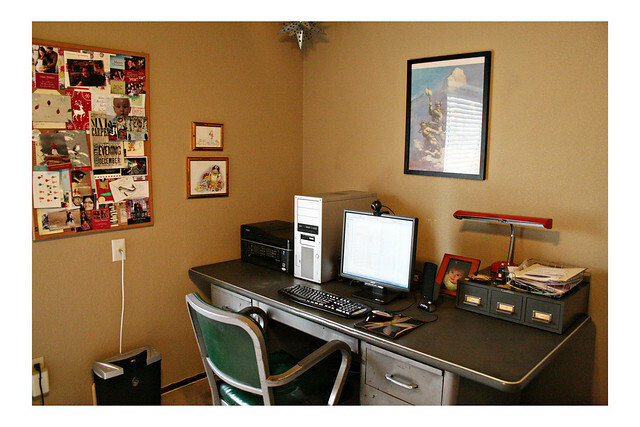 You’ll notice from the before pics that the desk was covered in crap. I’m not sure if I had the presence of mind to clear the cups and plates away from the computer, but when no one’s home I eat there on my lunch so there’s usually some, er, remnants. Damn. I really hope I cleaned that up for you guys. Now, however, it’s all cleaned off and shiny and I even organized the library card catalog file on my desk. Oh, and I fit as many of your Christmas cards as I could on my bulletin board. The rest on are the fridge. Thanks again, I love getting mail. For the most part, my Secret Shame is gone, but you’ll notice Isobel’s car seat in the corner. It’s back in Anthony’s car now, where it belongs, but I took this photo while he was in LA. I like to call this area “Nerd Corner.” Kind of like Pooh Corner, except its for nerds and not for er, Poohs, I guess. You’ll notice the nasty carpet I keep harping on. (It was nasty and old when we moved in.) In the Olden Days I’d have edited it out using Photoshop. But let’s face it, internet, our Honeymoon period is over and now you have to endure me and all my flaws. Oh, and not tonight. I have a headache. 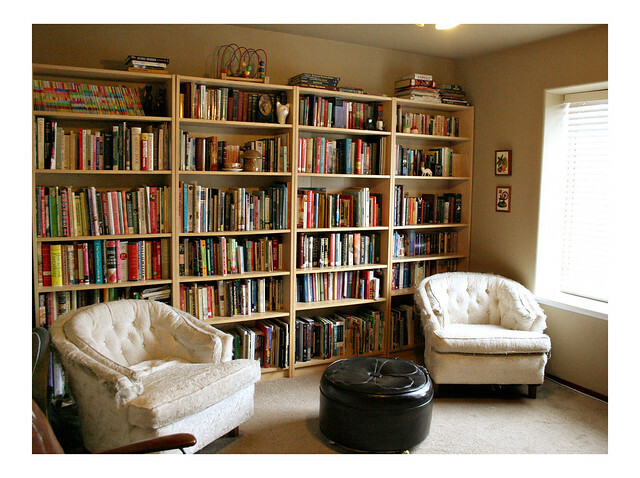 Here’s why we call this room the library. You’ll notice our book situation and how it has gotten out of hand. I’m eventually going to end up giving some of these away to friends and blog readers so stay tuned. I tried to do some weeding and it as largely unsuccessful. I found about five books I’d be able to part with. And let’s just say that Anthony and I are planning on buying more than five new books in our lives. Aaaand here’s the desk, so we’ve come full circle. What do you think? Cozy! My mom used to have a room with nine chairs in it, so you are still on the “good” side of chair collection. For now. I’m like the crazy cat lady. Of chairs. 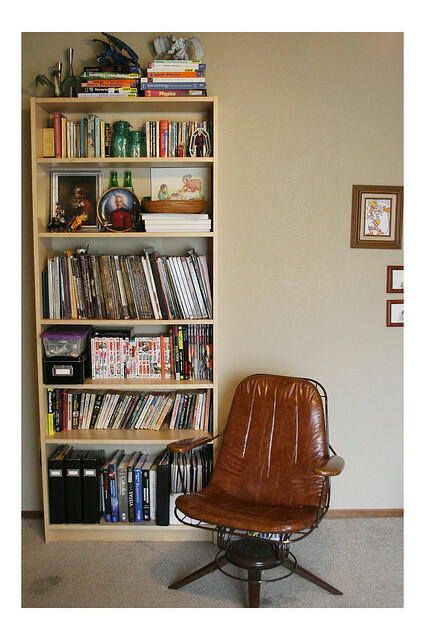 that line of bookshelves is just lovely. you’re my thriftspiration! 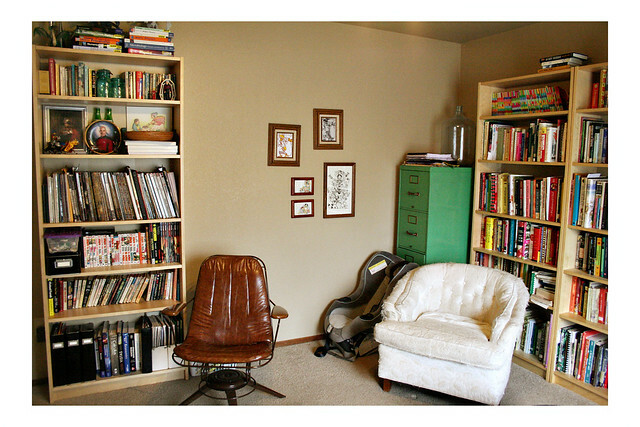 Bookshelves are ikea, but probably 80% of the books are secondhand. Can I come over and read a book? PLEASE do. If you’re ever in CA, you must stop by. I demand it. Julie, we might be soulmates. It looks awesome! 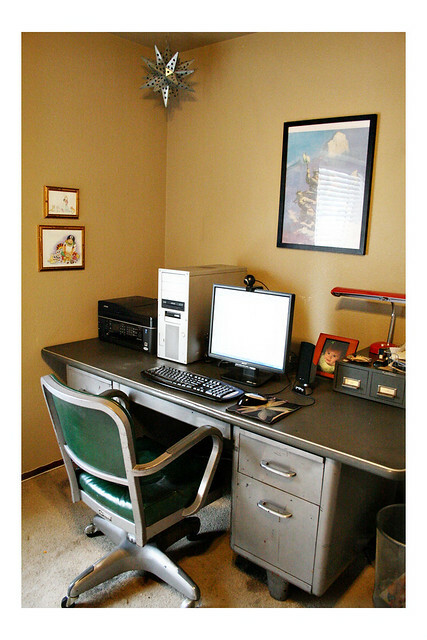 I love your desk – we used to have one like that in our house when I was a kid, and my hub had one from his old work, but it was too heavy/unwieldy to move one time a bit before he and I met. I love your style! It took four grown men to get it in here. I don’t think it’s ever going to leave. I love love love your library! My bedroom right now is basically a bed surrounded by books…I need to do my own organization. Question: You say you have a card catalog. Do you use it for your own books or is it decorative or what? And if you use it for yourself, how are your cards set up? I’m curious because I’m working on my own Excel computer file of books. Thank you! I only use the card catalog to organize my postal confirmation codes for my etsy shop, business cards, and coupons and giftcards. Although my stacks are loosely organized via DDS, I don’t use a card catalog for it. I played around with organizing them in Library Thing, but gave up after awhile.